HICKSVILLE, N.Y.– Stock Drive Products/Sterling Instrument (SDP/SI) has begun operations in a new facility designed to greatly improve efficiencies and lead times, the company announced recently. The newly constructed 96,000-square-foot facility is located at 250 Duffy Avenue, Hicksville, N.Y., less than 10 miles from the company's former location of 45 years. "This is a very exciting time for us," said Robert Kufner, president and CEO of SDP/SI, in a press release announcing the move. "The new facility will easily meet current capacity requirements, and gives the company ample room for growth as the shop assumes additional machining work." New CNC machining centers have replaced some of the older equipment and have increased the company's capacity, giving SDP/SI the capability to run 24/7, according to Wayne Martin, vice president of operations. SDP/SI (www.sdp-si.com) is an ISO 9001:2008- and AS9100C-certified company that provides mechatronic based design, engineering, and manufacturing services for critical motion control applications, including aerospace, defense, and medical. 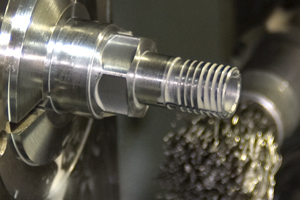 The company specializes in high-quality machined parts, molded components, precision gears, and gear assemblies. "The needs of our customers and the wide variety of projects we tackle here at SDP/SI are more demanding than ever before in terms of quality and delivery," said Martin. "Housing the entire company in one location will streamline work flow, free up bottlenecks, and improve responsiveness to customers' changing needs. The plant and equipment upgrades give us the ability to shorten lead times, improve quality, and decrease cost."